Can new modular, USDA-compliant meat processing units tucked into shipping containers help make small- to mid-scale farms more successful and sustainable? With the growing demand for local and humanely raised meats, pasture-based farmers have new market opportunities to become viable businesses. But the dearth of inspected slaughter and processing facilities in many regions of the country remains a chronic and expensive hurdle. 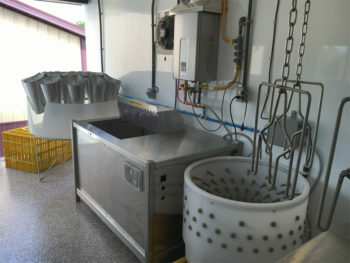 Mobile slaughtering and processing units, which bring the processing plant directly to the farm, seemed to be a solution to the shortage, but the costs and management of operating these units has caused many of them to fail in recent years. This was the case early in 2013 when the mobile processing unit (MPU) serving the Burlington, Vermont area went out of business. Farmer Bruce Hennessey, who raises thousands of pastured chickens and turkeys on Maple Wind Farm, a diversified livestock, poultry, and vegetable farm, and relied on the MPU, was at a loss as to how to process his animals to deliver to his wholesale and retail customers. The regulations governing meat processing involve a layer cake of federal, state, and local laws. But for poultry, the majority of states have an exemption that permits qualifying small-scale producers to process their birds on the farm in a USDA- or state-inspected facility; some states cap the number at 1,000 birds, others at 20,000. Each exemption carries its own rigorous rules determined by the state. “We decided to fill that gap and make a real business out of the pastured poultry,” he said. But when the brick-and-mortar project proved too costly and time-consuming, he took a chance on a “drop and go” unit called Plant in a Box. Sold by Featherman Equipment as USDA-compliant, it’s a slaughter and processing plant squeezed into an 8-by-40-foot shipping container. Hennessey was the first buyer. Upcycled shipping containers are proving to be an affordable and scalable technology for urban and exurban farms. Across the country, they are being called into service to grow hydroponic lettuce, herbs, mushrooms, and other produce indoors at a profit. In January 2017, Dirigo Food Safety launched another “plug and play” shipping container-based meat processing unit called the Locker. Like Plant in a Box, it’s a movable “cut and wrap” facility for beef, pork, lamb, and other meats to produce value-added products, such as bacon and sausage. Both Plant in a Box and the Locker are fledgling technologies that promise to resolve the logistical problems of the first generation of MPUs and the exorbitant costs of permanent processing plants while turning small- to mid-scale operations into sustainable businesses. As yet, Featherman has sold only four Plant in a Box units and the Locker prototype remains unsold. On-farm slaughter and processing is widely regarded by animal welfare advocates and groups like Animal Welfare Approved as the most humane treatment for livestock and poultry. It limits animal transport and the stress that goes with it. Along with addressing ethical concerns, farmers can retain quality control of their products from birth to butchering. Yet, the logistical and regulatory issues—from local, state, and federal agencies—create costly hurdles for time-, labor-, and cash-strapped farmers. David Schafer, the creator of Plant in a Box, knows each of these challenges firsthand. A farmer turned entrepreneur, he received funding for an MPU in 1995 that failed as a business due to the immense management complexities. “It’s a lot easier to move the chickens to the processing plant than the processing plant to the chickens,” said Schafer. Efficiency is Schafer’s litmus. He is the owner of Featherman Equipment, a manufacturer of backyard poultry processing equipment based in Jamesport, Missouri, used by poultry vanguards, including Joel Salatin in Virginia and Greg Gunthorp in Indiana. Plant in a Box consolidates Schafer’s 20 years of experience into the layout, equipment, and processes that enable farmers to process their own poultry without a massive investment in infrastructure. “There is huge economic potential in processing and you have to be efficient to do it,” he said. Similarly, the Locker aims to help the small- to mid-scale livestock farmers process for—and profit from—whole-animal utilization. Patented by Dr. Michele Pfannenstiel, a veterinarian and U.S. Army-trained food safety expert, the Locker is designed to further process red meat carcasses, including beef, pork, and lamb that come into the unit from a separate USDA-inspected mobile slaughter unit. While both of these shipping-container processing plants fulfill different needs, they have many common traits. 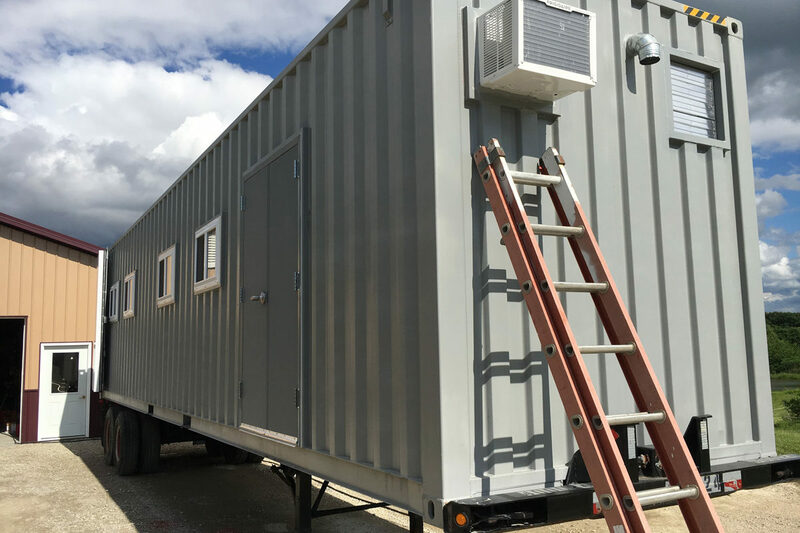 Self-contained, equipped, and climate-controlled with windows and ventilation, the containers sit on a gravel or concrete pad and are hooked up to potable water, electricity, and sewer lines. They’re constructed with USDA inspection top of mind in every detail from finishing materials to process flow to drainage, and both Featherman and Dirigo provide HACCP guidance and consulting to clear either the state or USDA approval process. In a recent webinar hosted by the Niche Meat Processor Assistance Network (NMPAN), Schafer and Pfannenstiel presented the estimated returns on investment of each unit operating just three days a week. For producers with the capacity to do their own processing or make value-added products, the investment can break even within a few years. 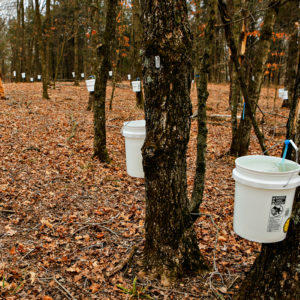 Of course, solid cash flow projections are only one aspect of a complex system that determines whether independent farms can become more viable, self-sufficient, and sustainable. Having an adequate existing market is key. “Your business already needs to be at that scale to cash flow that kind of infrastructure,” said Rebecca Thistlethwaite, program manager at NMPAN and the author of The New Livestock Farmer. And reaching that point by relying on outside processors is a challenge in many parts of the country. She also comments that it’s a true feat to process up to 20,000 chickens or 300 head of cattle per year—the proposed numbers of animals to make the units cost-effective—while also tending the farm. And while the units are sold as turnkey, there are many local zoning rules, along with county and state regulations, that can delay or prohibit installing a modular processing unit. 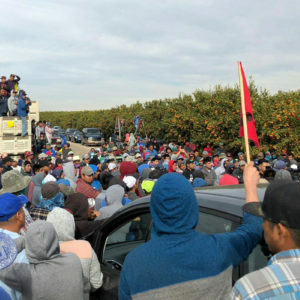 In Marin County, California, for example, local ranchers were prohibited from any on-farm slaughter on agricultural lands until the county supervisors overturned the 14-year-old ban this month. Current provisions in any locale may place limits on the numbers of animals and types of structures allowable, including Plant in a Box or the Locker. As the first Plant in a Box customer, Hennessey experienced a lot of trial and error to bring the unit up to speed legally. “The reality of doing it is really hard,” he said. “For us, it’s [taken] a solid three years.” But in 2016, by adding an air-chilling unit, Maple Wind Farm processed about 18,000 meat chickens and 2,000 turkeys—at the best quality they’ve ever produced, said Hennessey. I hope one day the boxes are outfitted with solar panels to still operate during power outages, and even earn at a lower rate, some of what would have gone on the farmers' monthly electric bills. Thank you, Lynne, for this excellent article. As a rancher and writer I have closely followed the question of slaughter and processing availability for years. I always think that complex problems require complex, varied solutions, and I consider the "box" units you describe here as a potential piece of the puzzle-- but at most a small piece. My major concern, and something the article does not address, is the waste side of it. No, I am not worried about pollution from offal and other difficult to use parts of the animal (for the most part, those can be addressed and the wastes would actually BENEFIT the ecology if properly composted). I worry, instead, about the lack of "highest and best use" that occurs with small scale and mobile slaughter units. The most important efficiency of larger-scale brick and mortar slaughter facilities is that they quite literally WASTE NOTHING. Every single part of the animal -- from hooves to feathers -- will go into some stream of commerce. (There's an excellent TED talk illustrating this well). In any event, it is totally cost prohibitive to do this will geographically dispersed facilities, thus a huge amount of EACH AND EVERY animal will end up as waste (even if it is composted). Even a lot of cattle hides end up being thrown away because it is too costly to use them when you don't have many. This is deeply troubling, and the reason I do NOT consider such facilities a key aspect of truly sustainable food systems. I mostly agree with you, but there are other economic factors at play with this. It's not just the cost of the box, it's also the cost of the added infrastructure to park the box if it will be mobile. Dedicated septics, extra corrals/holding areas, and concrete docking bays with proper drainage are not cheap. And then there is finding skilled responsible labor. One thing I've learned as a producer of meats on a small scale is that butchers are almost as under appreciated and misunderstood as farmers. I just wanted to point out that neither of these two facilities is for red meat slaughter, therefore the issues of waste/hides from a red meat plant are not a factor here. As for the poultry slaughter box, an entrepreneurial farmer can find a market for just about every part of the bird. The only potential waste- blood and feathers- can easily be composted on the farm and returned back to fertilize the pastures. 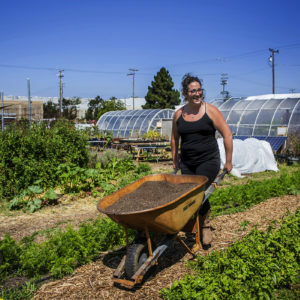 Cycling nutrient-dense waste back to the farm that grew the animals is one of the benefits of smaller-scale, on-farm processing facilities. Facilities like these are not for everybody, but they seem to be an important piece for growing very small operations to ones that can actually sustain livelihoods. For example, going from a 10,000 bird exempt operation to a 30,000 bird USDA inspected operation that can now sell their birds to any market. Scale appropriate processing that they can control is what many producers are asking for. I remember the old days when slaughter was more respectful and yes it was on a smaller scale.. I am sure there are many things that need to be worked out but I love that discussion and vision is happening. Better yet, stop raising killing and eating animals and dairy. Adopt a whole food plant based diet with no added salt oil or sugar. Our healthcare system would save about one trillion dollars per year with the reduction of heart disease, diabetes type 2, and cancer. I am interested in more info. Can you please provide me with detailed info.